Railpictures.ca - Matthew Tozier Photo: NS C93 slowly moves through the Fort Erie yard on the CN Stamford Sub with two of NS’ DC to AC Conversion livery AC44C6Ms on a bitterly cold afternoon. These were the early hours of a pretty nasty lake effect blizzard that soon layered the ground with at least 4 inches of snow. | Railpictures.ca – Canadian Railway Photography – photographie ferroviaire Canadienne. 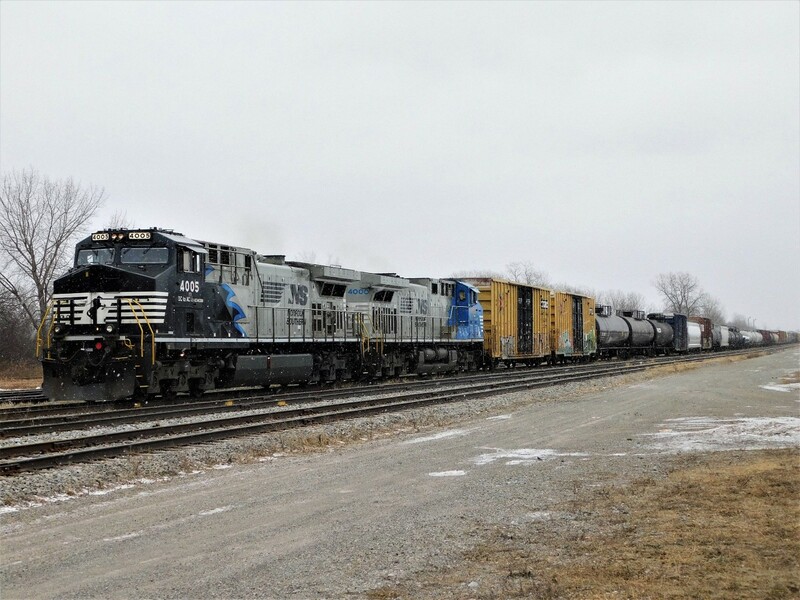 Caption: NS C93 slowly moves through the Fort Erie yard on the CN Stamford Sub with two of NS' DC to AC Conversion livery AC44C6Ms on a bitterly cold afternoon. These were the early hours of a pretty nasty lake effect blizzard that soon layered the ground with at least 4 inches of snow. Cool units, awesome catch Matt! I wasn’t able to get him crossing over the bridge but I got him exiting the bridge, I wasn’t a fan of those shots though so I decided to chase him down to here. Nice catch. Glad someone got this! Did you get them at the bridge too?